The worlds greatest gaming and geek culture podcast is back. This week we pretend that we’re in San Diego for Comic Con. We unfortunately play a lot more Pokemon GO, Hitman GO, We Happy Few and Broforce. Dayne also shares his review of the new Ghostbusters movie. Thanks for listening and have a great weekend! After our 2 week hiatus the worlds greatest gaming and geek culture podcast is back. This week we play a lot more Pokemon GO, Song of the Deep and Evolve Stage 2. Also in this episode we talk about Pokemon GO for way too long and Dayne shares his impressions of the Warcraft movie. Thanks for listening and have a great weekend! The worlds greatest gaming and geek culture podcast is back. This week we play some Street Fighter V Story Mode, Marvel Heroes 2016, Pokemon GO and of course more Overwatch. Rico reviews Finding Dori, tells us about his amazing new Nintendo themed kicks and we answer a bunch of your awesome questions. Remember there will be no Podcast next week as Rico is a scrub and going on vacation. We’ll see you back here in 2 weeks. Thanks for listening and have a great weekend! 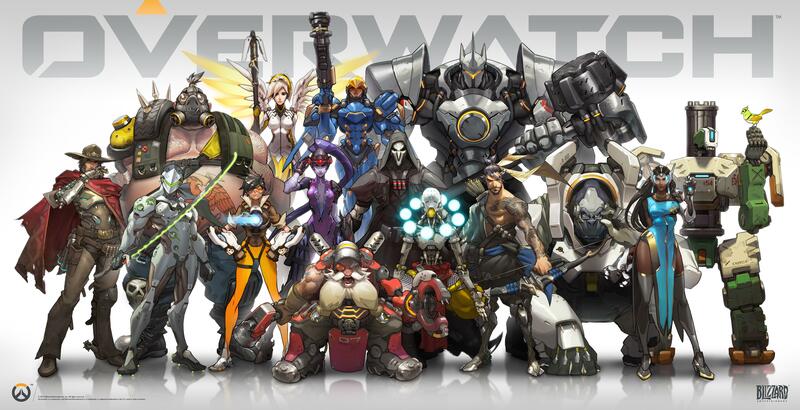 Blizzard Announces Overwatch, A Team Based First Person Shooter. At Blizcon this weekend, Blizzard announced their first new IP in almost 17 years. That game is called Overwatch, a FPS that kind of looks like a fresh take on the whole Team Fortress 2 formula coming to the PC. They released this absolutely incredible cinematic trailer for the game, that honestly looks like something Pixar could have made, yes it is that good, take a look below. Nobody does cinematics like Blizzard, just amazing. Currently they have announced 12 playable characters for the game, all with their own gameplay style and unique feel. There seems to be your classic tanks, and medics, alongside newer more exotic type characters like an archer and a samurai looking character. Battles take place in a variety of levels, and usually have some sort of team-play element besides just kill the other team. There appears to be capture and hold, some defend this area, and I am hearing there is even a Protect this thing as we move through the level type mission. They look to be trying to have a good variety in the gameplay and with the large character roster a little something for everyone. You can check out some gameplay in the trailer below. This is pretty huge stuff, as Blizzard hasn’t made a completely new IP in a LONG time. I think Diablo was the last new IP that Blizzard had created and every game that they have made since then has either been a sequal, or a game using an existing IP; Hearthstone, Heroes of the Storm etc. The fact that we are finally seeing Blizzard doing something that is not only new, but also something they have never done before; they have never made a FPS game, is very exciting. If Blizzard can give this the same kind of love and polish that we have seen from them in the past, well that is a very exciting thought. I can’t wait to get my hands on Overwatch and give it a try. If you are as excited about this as I am, you can sign up for the closed beta coming early next year, right over here,on the Official Website. We also have some screenshots for your viewing pleasure as well below. No release date has been set, and no platform besides the PC has been announced as of yet.